Tony the Tiger is a cultural icon. His raw animal ferocity exceeds the confines of the cereal box he appears on. His presence transcends mere association with the sugared corn flakes of which he was conceived. More accessible than Shere Khan. More renowned than The Tiger Who Came To Tea. Less annoying than Tigger. Sure, he’s looked different over the years, but he’s always been there for us, with his can-do attitude towards eating Frosties (Frosted Flakes in the US). Tony is the Tiger we deserve. So of course he has a Twitter account. 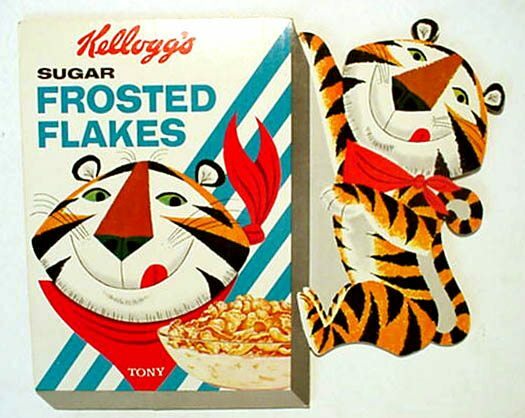 Tony the Tiger in the age of Twitter is a strange CGI creature who loves to play sports and eat cereals. Its content is a weird mix of healthy living advice and smashing back as many Frosties as possible at all times. But the account itself is decent: a solid following-followers ratio, frequent tweets, he’s even verified. Yup, Twitter itself has given TtT a ringing endorsement: this tiger is the real deal. Ah, cleverly getting around IOC guidelines in advertising by saying “Summer Games” in place of “Olympics.” Tony, you savvy social marketer you. Prima facie, it appears that Tony is doing everything right. What a shame that Tony has an absolutely bizarre online following. Yup, we’re talking about frickin’ furries. Yup, furries. People who dress up as big furry creatures. The kind of people who went to go see Zootopia about ten times, even though they’re in their thirties. The kind of people who go to conventions with names like ANTHROCON and FURFEST. The kind of people who still go on DeviantArt. I don’t want to be too harsh about them though. It’s just a lifestyle choice. To them, my heteronormative non-fursuit-centric exploits are probably some kind of freakish nightmare. We’re all just different. Only, I don’t sexualise a CGI tiger that sells cereal. You see, as detailed in gruelling detail by Gawker (RIP) in this article, furries have a strange attraction to Tony, sending him lurid messages on Twitter than can only be described as… NSFW. I really don’t want to put any of them in this blog, just go check out the @realtonytiger replies on Twitter if you really must see, but for illustrative purposes here’s one from the last 24 hours. I repeat, this is one of the cleaner ones I could find. Some of them are just horrific. Being the account manager for the account must be a simultaneously fascinating and forever-life-scarring experience. Anyway, things got so bad that Tony the Tiger had to put out a statement asking people to please please please oh god please stop tweeting NSFW things at him. I kinda admire the fact that they did this in character, even slipping in a “gr-r-reat.” Tony the Tiger: always on-brand no matter what. Naturally, this only incited the furry fandom. Tony also started blocking users, which is a pretty surreal experience if you think about it – a cereal mascot from your childhood actively prevently you from engaging with them. The lines between fantasy and reality start to become blurred at this point, like some kind of IRL Jumanji. (Just another example of a weird reply. Nothing to do with me). What does this tell us about the cultural zeitgeist right now? Well, there’s something weird going on with jungle animals, it seems. Didn’t they just remake the Jungle Book? And isn’t a dead ape currently the most popular figure on Twitter right now? And isn’t that same dead ape currently polling at 5% in the US Presidential race? Just what the hell is going on? In any case, I’m glad the @realtonytiger Twitter account exists. It’s a reminder that in an infinite universe, anything that can happen will eventually happen, and that even the most mundane thing like a box of cereal can tell us surreal and magical stories. I just hope and pray that the furries never find out about Sooty.